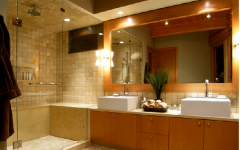 Bathroom Remodeling Trends for 2014 - CA Green Remodeling, Inc.
It’s only the beginning of 2014, but we’re already starting to see trends emerging for bathroom remodeling. Homeowners are becoming bolder with their ideas and what used to be mainstream is becoming a thing of the past. Some you may find interesting enough to try out yourself, and others you may leave for other trend followers to use. Either way, hopefully, you’ll find inspiration in the following bathroom remodeling trends of 2014 for your next bathroom renovation project. For those who want to step out of the ordinary bathroom with pale wooden walls and into something a bit more spectacular, bold colors and unusual textures are being used. This trend includes homeowners using colors that you wouldn’t normally see in bathrooms, like maroons, black, grays and monochrome to name a few. Then to switch up the typical walls, we’re seeing more textures like wooden paneling, marble and even glass tiles. Another bathroom remodeling trend is transforming home bathrooms into a spa. This isn’t only possible for the rich and elite. The average person can now enjoy an oasis that is fit for more than just washing up. With fixtures like hot tubs with massage jets and décor commonly used in spas and boutiques, such as rugs, lounge chaises and walk-in shower stalls with built-in seats. Who wouldn’t want a spa experience right at home? It’s amazing how old fashions can quickly become new fashions. Claw foot bath tubs are nothing new, but there is a new trend of them spreading like wildfire and it’s expected to increase rapidly throughout 2014. There are many different varieties of freestanding bathtubs that you can choose from, allowing you to get a distinct look that fits your taste. Although these are old style bath tubs, they will add a modern feel. You’ve heard the term two heads are better than one and the same is very true for showerheads. We’re likely to see more homeowners installing double showerheads in their bathrooms. 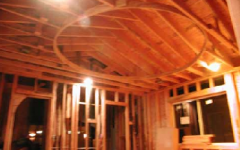 One trend in particular aims towards installing two showerheads in the ceiling, versus the walls. This would be a great addition for a spa-inspired design. Instead of knocking down walls to make a bathroom larger, homeowners are making do with their smaller bathrooms and making amazing transformations. Who said that a small bathroom can’t be luxurious and beautiful? 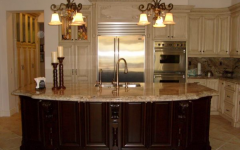 With the right added appliances and colors, you can have a bathroom that really pops. 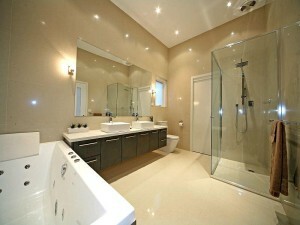 If you really want to create space, frameless showers and wet rooms are on the to-do list of many American homeowners. You’ll find that having a frameless shower will create an airy space that will make even the tiniest bathroom appear larger. To add warmth the winter of 2014, we’re seeing a trend of homeowners installing dark wood floors in their bathrooms. This can be complemented with dark brown wooden walls or walls painted a dark brown color. The water fixtures you use can also make a bathroom look warm, such as those made of copper or dark stainless steel. Dark wood floors could also be a funky addition to bathrooms with dark colored wooden paneling on the walls. 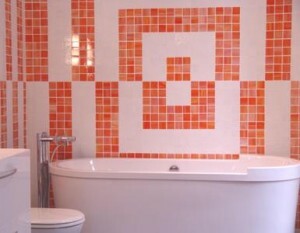 We’re likely going to see a trend of bathroom walls and accessories that have geometrical designs. This is a great way to add dimension to a bathroom’s that are geared towards a modern feel. Some may even add old fashioned elements, freestanding bath tubs with claw feet and groove wall cladding. Boring old bathrooms with little color and personality are soon to be a thing of the past. More and more homeowners are starting to breathe more life into their restrooms by being more bodacious with their colors and designs. Unique shower curtains, rugs and wallpaper are likely to be added after a bathroom remodel to give a signature touch to the design. This could mean odd colors like maroon, pink or even dark colors like black and gray being used in the décor – all depending on the personality of the homeowner. If you live along the seaside, you can create a theme that is affordable and beautiful. The trend here shows homeowners using clad walls, sailor stripes, groove and tongue paneling and white-washed wooden boards. Let’s not forget the final touch with shabby chic furniture that many will find a great way to complete a coastal theme. If there is a wall facing the sea, you can even cut out a window or install a larger one, so that you can have an “in your face” view of the ocean. The variety of bathroom remodeling trends that we are likely to see in 2014 extends further than what was just mentioned here. Whether you choose to go with bold colors and textures or a heightened bathroom-spa experience, you’ll find that your bathroom remodel is ahead of the trends. Whatever you decide to do for your bathroom remodel, make sure to contact the licensed bathroom remodeling contractors at CA Green Remodeling for a free quote.